Living in Singapore: Oman: Toto! 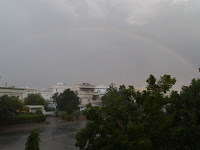 Heavy cloud over Muscat in the last few days brought a dump of rain to Azaibah this afternoon. The skies went black and strong gusts of wind picked up bits of rubbish and small animals reminiscent of the scene in the ‘Wizard of Oz’, which still gives me nightmares. It was all over in minutes. Better get rid of that before we arrive lad - I want me some sunny nips please! !